Kids Crafts : 10 super cool water games, to try with kids this summer! 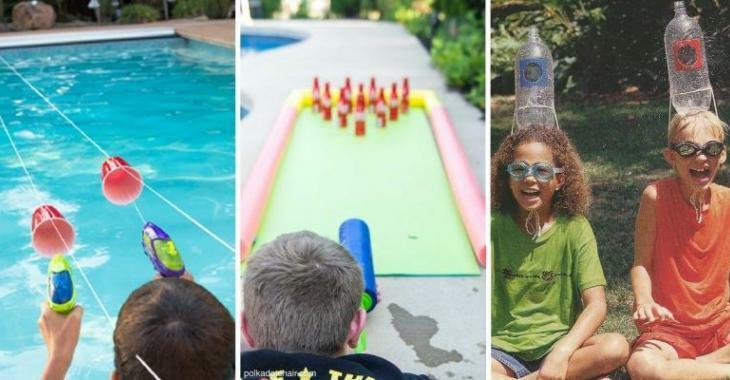 10 super cool water games, to try with kids this summer! 10 games to do yourself! Get jugs of milk or juice to make large containers that will serve you to catch small water balloons! How many can you catch without dropping them? Add a few drops of paint in water guns! The children will be able to paint abstract paintings with water guns, filled with colored water!! Make a keel alley with pool noodles! And drop aluminum bottles of Coke, they have the ideal weight to use a water gun made of foam! Play Baseball, but with water balloons! woohoohoo! That’s a lot of fun! Who will dare to get wet? Make two teams! With water guns, you should target the hole! The one who fills the bottle with as much water as possible in a predetermined period of time, wins the game! Don’t spend for one of these toys connected to the garden hose for children to play with water! DIY! Get an old pool noodle! Do you know those who crumble themselves by dint of chlorine? The toy won’t cost you anything! -Skewer or something sharp to pierce the pool noodle. 2) Every 5 cm (2”) pierce the pool noodle with the skewer. 3) Insert the garden hose into the other end and insert small remaining to keep the hose tight. You can play this game inside or outside of the pool! Older children can make it themselves. You just have to pierce two plastic glasses and to pass strings, then you attach them to chairs or bars, the two strings need to be parallel. The glass that comes to the other side first wins! You need water guns with water tanks big enough to fully cross the rope. It takes little material! Chalks and wet sponges! And it's so much fun! In addition, we practice math! Yay! Make a water fight of wet sponges! First children will enjoy create them, then they can do the water fight of sponges! It's longer than a water fight of water balloons! It's MUCH easier than you can imagine and MUCH more resistant than you think! 1) You need a lot of space! 3) Use the parchment paper to cover the entire outline of the tarpaulin by folding it in half, cover the underside and top of the tarpaulin. 4) BE CAREFUL! Iron ON the parchment paper WITHOUT touching the plastic tarpaulin. 5) Leave a small opening to add water to the water mattress. 6) Once done, pull out the mattress outside, insert the garden hose into the hole and fill it with water! 7) Seal the hole with Duct Tape after wiping it with a dry towel! This is really EASY to do! !